Hello happy hookers and welcome to my first tutorial >insert happy dance here!<. At the weekend by lovely partner in crime (or the other half!) was meandering around town when he saw this super old book in one of our local charity shops (yes we frequent them I mean do you know how many old people donate yarn and hooks these days). He said he instantly thought of me and I can see why. It's a gorgeous old needlecraft book filled to the brim with vintage macrame, crochet, and embroidery to name just a few. I instantly flicked to the crochet section and was greeted with lots of black and white drawings of techniques and stitches. Uninspiring to some, but to me I knew they needed to be recreated.....in colour! So I picked a stitch, the Paris stitch to be precise, and set to hooking. This stitch is super easy, great for a beginner to add texture and pattern to a simple piece, and it's divisible by three (maths is not my strong point! ), so mathematically relatively easy. Any yarn you desire - I have used Stylecraft Acrylic DK in both Cream and Fiesta (cool name right?). A hook that is suitable for your yarn and project, I used a 4mm metal hook because that's the hook I prefer that matches my yarn, and because this is just a swatch. Chain your desired length, the length of chains must be divisible by three plus one. I chained 22 (21 which is divisible by three sevens times, plus 1 makes 22). Once you have your number, ch an extra 3. Now here I have a total of 25 chains (my number divisible by 3 which is 21, plus 1 equals 22, plus the ch 3 at the end, ta da 25 chains. 2. Turn, work the following in the 4th ch from the hook (1tr, ch2, 1dc). You should have something that looks like the below. 3. *Skip 2 ch spaces and crochet the following into the next ch (2tr, ch2, 1dc). Repeat from * to the end of the row (you will crochet the last set of stitches in the last chain space. Now at this point I will forgive you for thinking, wow what a crumpled mess, but don't worry, the more rows you add in this stitch, the more the work straightens out, (it should look something like the below). 4. Ch 3 and turn your work. The next part is a tad tricky in that you have to locate the correct space to work into, and all of the stitches are quite close together. You are going to work 1tr, ch2, 1dc into the ch2 space of the previous row. It's the space directly after the two trebles (larger stitches). Ive tried to demonstrate on the below picture. 5. *Into the next ch2 space from the previous row crochet the following (2tr, ch2, 1dc). Repeat along the row from * to the end, finishing up in the last ch2 space. Quick note here, you will notice that all of the ch2 spaces are semi circles on the work, they produce what looks like an arc and this makes them easier to notice if you are struggling to se them. Now hopefully your work should look like this. Repeat the last row until you have the desired length for your project. I Changed up my colour in the 5th row to cream (for an easy colour change technique this is the technique I use), and then back again a few rows later. I think the change and contrast in colour really makes the stitch pop. Finally weave in your ends (like I did! Not!). 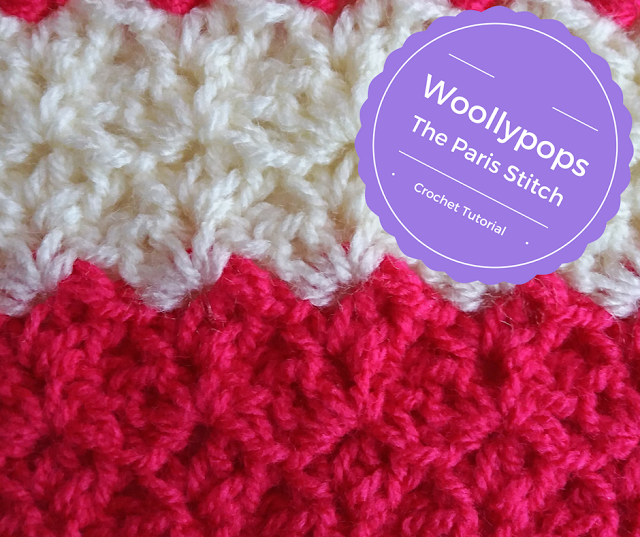 I love the simplicity of this stitch, and that ven though it is simple, it gives great texture and complexity in your crochet. I mean its 3 fricking stitches! How much more simple can you get?! If you enjoyed this tutorial please check me out on social media.